On April 8, 2013 Dr. Robert Packer and his wife Dorothy visited our library. Library staff showed Dr. Packer our new library and took pictures. It was really nice to meet Dr. Robert Packer and his wife in person. 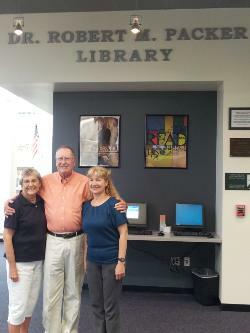 Dr. Packer donated $200.00 to the library. We are proud of been Robert M. Packer Library. Attached please find two photos. 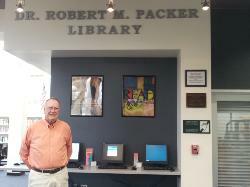 Our school library is named after Dr. Robert M. Packer. Doctor Packer had worked at Nogales High School for 11 years: as an Athletic Director and Varsity Football Coach - 1962 to 1965; as an Assistant Principal - 1965 to 1970; and as a Principal - 1970 to 1973. Doctor Packer donates $200.00 to our library every year.